Summary: This project will involve shielding 35 county leased, FPL owned, streetlights within unincorporated Volusia County or on County right of ways between Ormond by the Sea and Ormond Beach, FL. Each of the candidate lights are currently visible from the beach, causing beach illumination or both. Shielding these lights would ensure human safety along the roadway while also creating a darker beach, safer for nesting sea turtles and emerging hatchlings. Volusia County has a Habitat Conservation Plan (HCP) which has been in effect since 1996. During its inception, the County developed a beach lighting management plan and adopted and committed to enforce a county wide lighting ordinance as the primary form of mitigation. However, when the HCP was renewed in 2005, the primary mitigation was shifted from the light management to the Marine Science Center in Ponce Inlet. The County continues to manage the lighting ordinance as a Voluntary Conservation Measure described in the HCP. Results: This grant allowed the installation of thirty five (35) shields on street lights between Ormond by the Sea and Ormond Beach. This improved the nesting habitat along an urban beach. The immediate result of no disorientation events within the vicinity of these lights in 2013 indicates that the project has been successful. Volusia County is committed to continuing enforcement of its lighting ordinance and will continue to proactively educate and enforce the regulations to adjacent property owners. 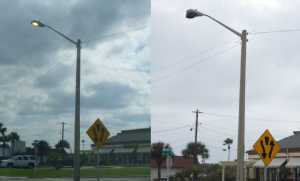 These lights set an excellent example of safe and compliant roadway lighting.